Promote amazing images, designs, and more, with Placeit's print mockups. Our mockups are easy, fast, and functional. They feature the best settings, locations, and models. Just customize the settings to your liking and you're ready to go! Try it out now. Got some cool designs ready to be displayed on a banner? Why not show them off with Placeit? Our mockups are super easy to use and don't require any additional software. You can even change each color in the mockup. Cool, right? Try it out now. 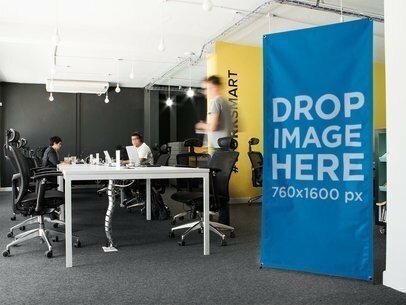 Create an amazing visual to promote your latest roll-up banner designs with Placeit's mockups! This cool mockup is a great choice if you are looking to promote your latest design or to make an online campaign using visuals that will attract more people. Customize this image's background colors and show your latest roll-up banner design. Create an amazing promo image for your roll-up banner designs. Placeit has a ton of mockups just for you. They're super easy to use and don't require any additional software. Try it out, it's fast! Just customize the settings to your liking and you're set! Edit your Roll-up Banner now. Create a cool visual featuring a roll-up banner using Placeit! This cool mockup is a great tool that you should use to promote your designs for a roll-up banner. Start now showing your audience a render version with background colors of your latest roll-up banners. Use Placeit and get awesome visuals without the need to use a complicated tool! Got a new product or idea ready to be showcased to your specific target market, but can't seem to decide on which might be the best way to do it? Stop stressing and go ahead and check out Placeit's banner mockups today to help you solve your problems immediately! To use one of our banner mockups all you need to do is upload an image onto the template of your choice and within no time, you will get an original visual asset ready to be added to your marketing campaign. Impressive don't you think? So what are you waiting for? Stop wasting time and begin using banner mockups now! To see another Banner Mockup click here! This is a great mockup if you need to pitch a new ad campaign. Your client will get on board quicker than you can think of if you use photo mockups, they give an extra punch to your presentation guaranteed. But not all photo mockups look realistic, however at Placeit all our templates are curated specially to fit your brand's needs. 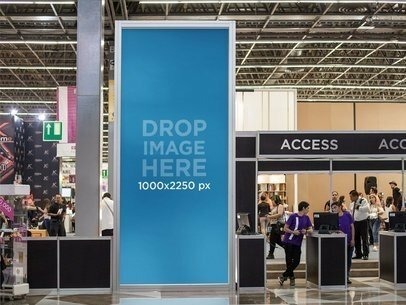 Reach a new audience when you add visual assets to your campaigns, you can try this print template featuring a vertical banner at an expo to see how it works. To see another Banner Mockup click here! 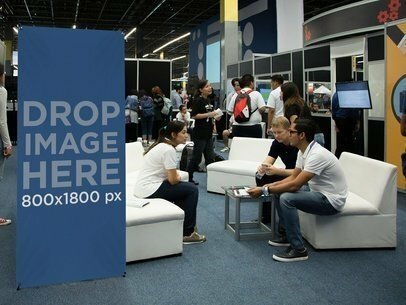 Whether you need to advertise a conference or a concert, this banner mockup template will work for you either way. This banner mockup lets you display your own image on the banner without using Photoshop, making it an easy marketing tool for you to use. So what are you waiting to make it part of your visual marketing campaign? To customize this banner mockup, all you need to do is drag and drop your image file of whatever it is you are looking to advertise onto the template and within no time you will get an original visual asset ready to be added to your marketing strategy! So stop wasting time and begin using banner mockups immediately! To see more Banner Mockups click here! 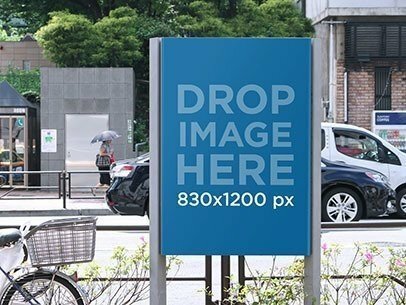 Take a look at this awesome mockup of a vertical banner hanging on a street light pole, it's a beautiful visual asset that you can start using if you are looking to make more money with your designs! All you have to do is drag n' drop a jpeg or png file over the interface, it'll be processed automatically. Start using Placeit to showcase your ideas the right way! Try another Banner Mockup here! Thinking about upgrading your current visual marketing strategy? If you are, then waste no more time and start using Placeit's banner mockups to help you achieve this in an original way right away! To see another Banner Mockup click here! 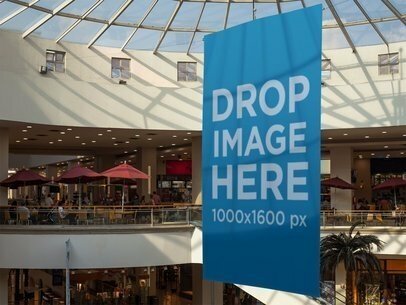 Make this banner mockup at a shopping mall a fundamental part of your new product’s visual marketing campaign and catch your prospective consumers attention at a glance. To customize this original banner mockup, all you need to do is upload an image of whatever it is you would like to advertise onto the template and in a matter of minutes Placeit will deliver a compelling image ready to be used immediately! So what are you waiting for? Make Placeit’s banner mockups an essential part of your marketing tools today and start achieving success right away! To see more Banner Mockups click here! 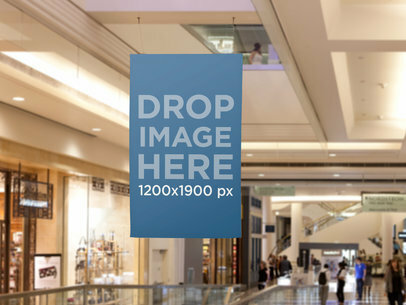 Customize this vertical banner mockup hanging from a ceiling at a convention center by simply dragging and dropping an image of whatever it is you would like to display onto the template and within minutes, get an original visual asset for you to start using as part of your marketing campaign. To see more Banner Mockups click here! 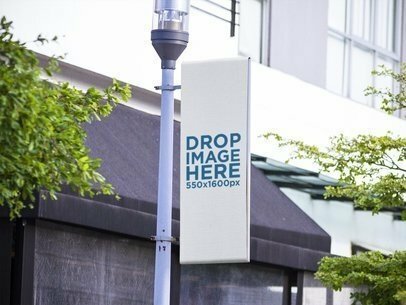 Take a look at this awesome mockup of a vertical banner hanging from a light pole in the city, it's a gorgeous visual asset that'll help you build a much stronger image marketing. Start using Placeit and make your revenue grow! You just have to drag-and-drop a jpeg or png image file on the interface, we will merge it for you in just seconds. Awesome, right? Try another Banner Mockup here! 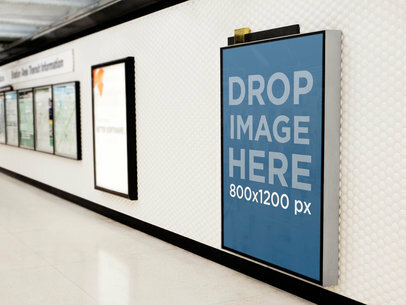 Check out this image mockup by Placeit! 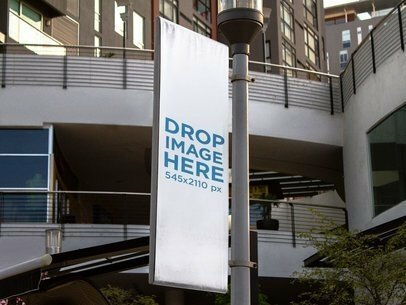 It features a vertical banner hanging from a light pole near a new building, it's a really cool urban visual asset that you can use to portray your ideas in a smart and convenient way. You just need to drag n' drop a jpeg or png file on the interface, we will take care of the processing for you. Try another Banner Mockup here! 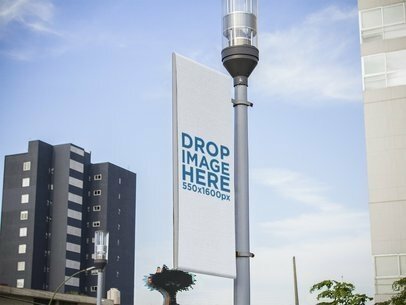 Take a look at this vertical banner hanging from a light pole in the street, it's a cool image that you can use to portray an urban and modern design, start showcasing your ideas with Placeit! All you have to do is drag n' drop a jpeg or png file on the interface, we will process your image in just seconds. Use Placeit and make more money with your designs! Try another Banner Mockup here! 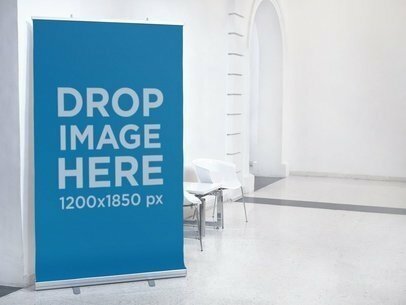 If you're looking for an eye-catching way to advertise an event to your students, then this vertical banner mockup outside a classroom might be just what you need! So waste no more time and customize this amazing banner mockup right away by simply uploading an image of your event onto the template and within no time get an original visual asset for you to start using instantly! To see another Banner Mockup click here! 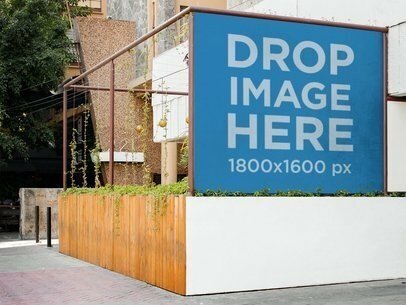 Use this photo-realistic poster mockup to show off your new advertisement in a the real word. This poster mockup is hanging on the wall of a subway station. The subway stations wall is made up of white hexagonal tiles. The top of the poster has a gold accessory accenting your advertisement. The poster is set within a large metal frame that stands out from the wall. This mockup will hold an image of 800x1200px. This is perfect for an urban ad. 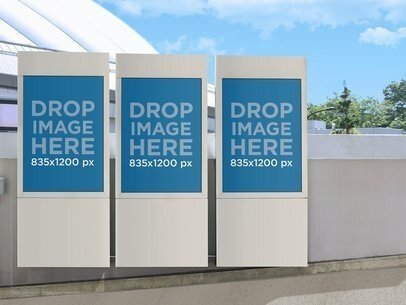 It's time to display your designs in less time and money! 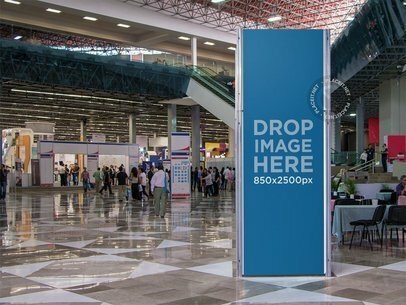 Need a banner mockup for a convention center? 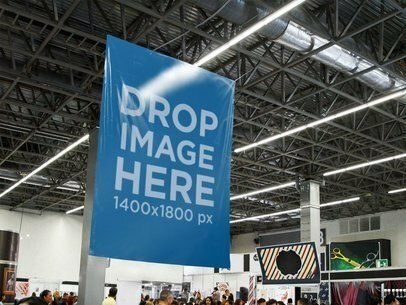 This print mockup features a roll-up banner near a lounge at an expo, just the visual asset your brand needs to stand out. 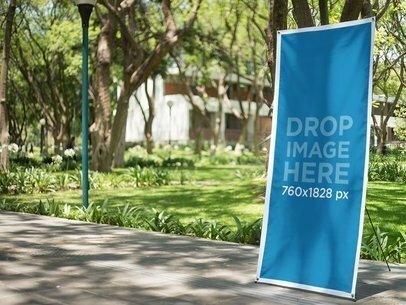 Try dragging and dropping one of your images to see what the banner will look like in real life! Get amazing results and broaden your market with this unique mockup tool built to strengthen your marketing campaign. To see another Banner Mockup click here! A beautiful billboard mockup on a building wall, in what could be a university or a very lively downtown area. This poster mockup is ideal for any print ad that you want to showcase, preview or test on a real environment like this great billboard mockup. 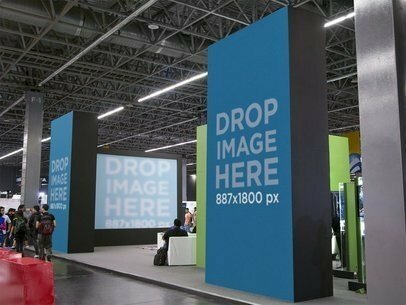 Get your ad noticed with this mockup template of a giant vertical banner and screen displayed at an expo. Stop wasting time on searching for stock photos and use our mockup generator to create different scenarios for your brand. Pitching in advertising has never been so simple with this cool mockup tool. Get amazing results on your marketing strategy with photorealistic mockups today! Go ahead and drag and drop your image to see the final asset! To see another Banner Mockup click here! Are you in need of an amazing image to help you enhance your current visual marketing campaign? If you are, then don't think about it twice and check out Placeit's banner mockups. 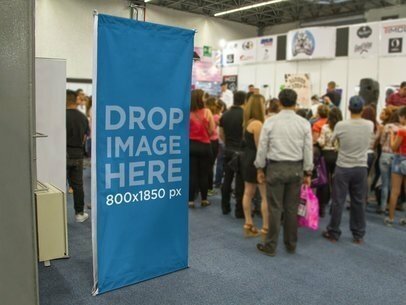 This banner mockup for, example features a vertical banner at a trade show. Imagine how your ideas would look being advertised within this great template, don't you think your potential consumers would love it? If you do, then stop wasting time and begin using banner mockups today! To see another Banner Mockup click here! 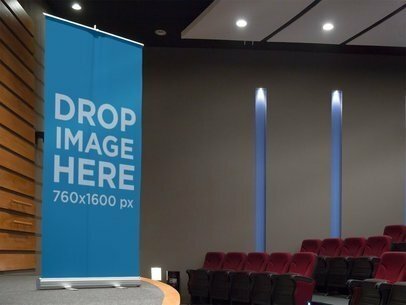 Customize this vertical banner mockup in an auditorium stage by dragging and dropping an image of whatever it is you are looking to advertise onto the template and within no time get a compelling visual asset ready to be used right away! To see another Banner Mockup click here! 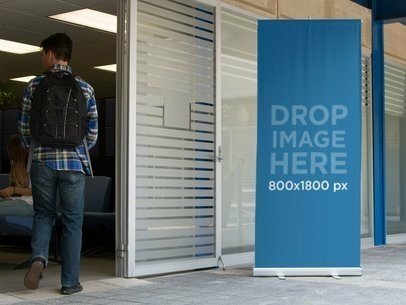 This vertical banner mockup outside a school counselor's office could work ideally for you to advertise a conference or a school event, so don't think about it twice and customize it right away! To customize this banner mockup all you have to do is drag and drop an image you'd like to display within the banner on the template and we will handle the rest of the work for you. It might be time to upgrade your marketing strategy and what better way to do this tan with Placeit's banner mockups help! To see another Banner Mockup click here! 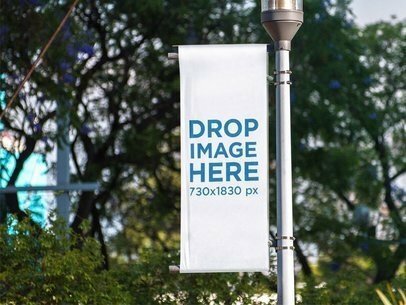 This vertical banner mockup at a University Campus could work ideally for you to advertise or promote pretty much anything you can think of, so stop wasting time and customize it immediately! To see more Banner Mockups click here! Take a look at this awesome vertical banner mockup over a PNG background. This versatile mockup can adapt into different situations your campaign needs, simply place your ad design over the mockup template and our mockup generator will start working on your mockup in no time! Use print mockups to create a better impact on your audience and save much more from your budget. To see another Banner Mockup click here! 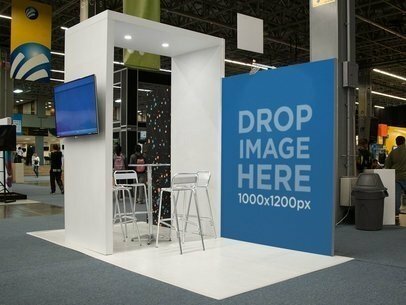 If you're looking to boost your business visual marketing campaign, then this vertical banner mockup at an expo might be precisely what you need. So what are you waiting for? Waste no more time and customize this beautiful image today and get an amazing visual asset to add as part of your marketing campaign within minutes! To see another Banner Mockup click here! Create incredible photorealistic mockups with Placeit’s mockup generator. It’s so easy to use, you will have your mockup in seconds! All you do is drag and drop your image of choice over the template and you are done, easy right? Try this vertical banner mockup to display your latest advertising campaign, your pitch will never look the same. Print mockups make all the difference to reach your goal to a successful strategy! To see another Banner Mockup click here! 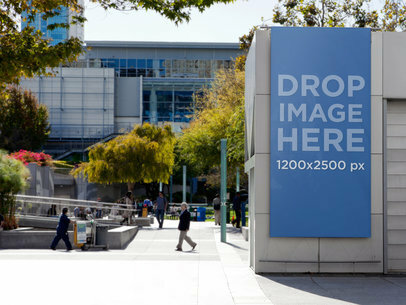 Use this vertical banner mockup at an art museum to promote or advertise pretty much anything you can think of and appeal to your specific target market at a glance! To customize this vertical banner mockups just upload an image of your choice onto the template and let us handle the rest of the work for you. It's time for you to start standing out and believe us when we say that there's no better way for you to achieve this than by making Placeit's banner mockups the latest addition to your marketing tools! To see another Banner Mockup click here! Enhance your current visual marketing campaign by making Placeit's banner mockups an essential part of it starting today and catch your potential consumers attention within no time! 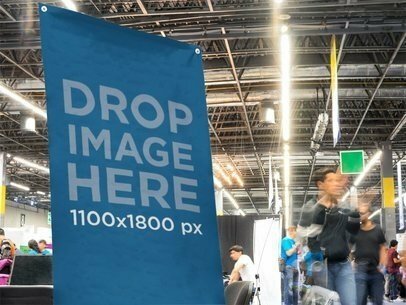 To customize this banner mockup featuring a vertical banner in a street flea market, just simply upload an image file onto the template and let Placeit handle the rest of the work for you. Pretty simple right? It's time for you to start enjoying great visual content and believe us when we say that there's no better way for you to achieve this than by making Placeit's banner mockup the latest addition to your marketing tools! To see another Banner Mockup click here! Display your latest advertising idea on this print mockup of a roll-up banner at an outdoor bazaar Great shot don't you think? Simply place your image over the mockup template and you'll have your own banner mockup ready in no time. See for yourself why it's so easy and quick to use mockups with our mockup generator. Start boosting your brand with this incredible marketing tool! To see another Banner Mockup click here! Get the attention you want with a great visual asset like this banner mockup. Try our Placeit mockup generator and see the final result instantly, all you do is drag and drop your image over the template and done, easy right? Print mockups are a useful marketing tool that will help boost your advertising while saving money. Select your favorite mockup and be on your way to a better marketing strategy. To see another Banner Mockup click here! Give your brand a fresh new look with the help of photorealistic mockups. Your marketing strategies are going to be completely upgraded when you start using our mockups and say goodbye to PSD file struggling! Our mockup generator is made to help you deliver compelling visual elements to your clients while saving time and easing your ad budget. 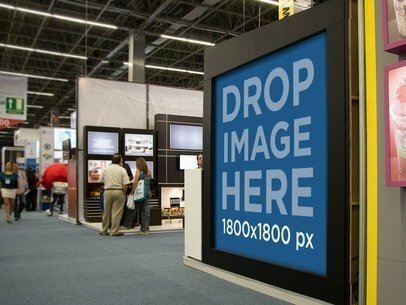 Try this template featuring a vertical banner at an expo to see how your product could stand out! To see another Banner Mockup click here! 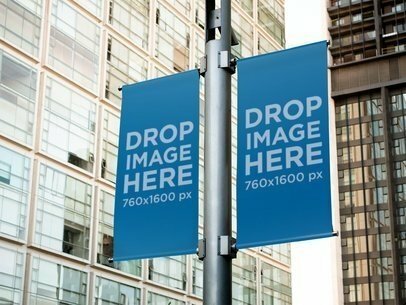 Customize this beautiful vertical banner mockup from Placeit featuring a banner on a sidewalk at a busy street by simply dragging and dropping an image of whatever it is you are looking to advertise onto the template and leave a lasting impression on your specific target market within no time! If banner mockups are not precisely what you are looking for, then go ahead and check out some of our iPhone Mockups by clicking here! 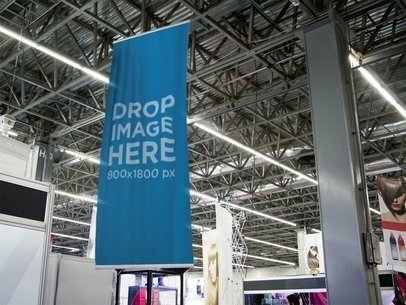 This original banner mockup featuring a set of banners at a shopping mall could be just what your visual marketing campaign needs in order to stand out and catch your specific target market's attention, so waste no more time and customize it right away! To see another Banner Mockup click here! Start promoting your brand with spectacular visual content made possible with photo mockups! 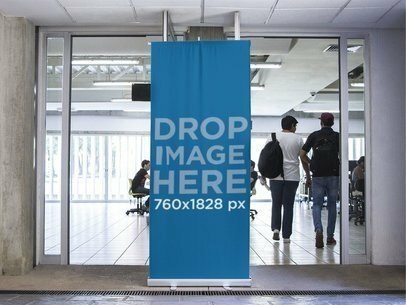 Try this print mockup of a vertical banner standing over a PNG background. Customize it with your own artwork to see how great your campaign will look! All you have to do is drag and drop your image over the placeholder and our mockup generator will create your mockup in no time. What are you waiting for? Boost your brand now with photorealistic mockups! To see another Banner Mockup click here! It's time to showcase your latest ad pitch with a useful print mockup! Placeit mockup generator will save you hours of time on production by simply dragging and dropping an image over the placeholder and done! Try this template featuring a roll-up banner at an outdoor bazar, very realistic! Stop wasting time on Photoshop and start engaging with your audience the right way with the help of mockups! To see another Banner Mockup click here! 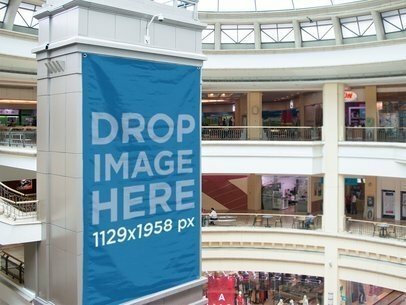 Here we have a poster mockup of an ad hanging from the ceiling of a lovely metropolitan mall that you can use to show off a gorgeous ad. The add hangs over a brightly illuminated passage at the mall. Elegant stores line the the sides of the wide corridor. In the background, you can spot a set of escalators and the many people that are shopping. The poster is hanging on the edge of a skylight. You can see people standing at the balcony above. The poster mockup will allow an image of 1200x1900px. 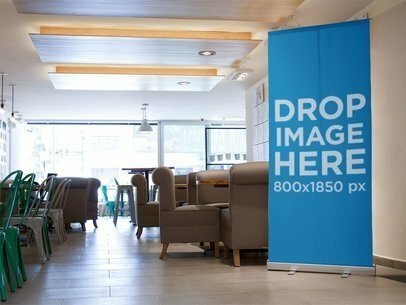 If you're looking to boost your business visual marketing campaign, then this vertical banner mockup inside a coffee shop might be precisely what you were looking for. So what are you waiting for? Waste no more time and customize this beautiful image today and get an amazing visual asset within minutes! To see another Banner Mockup click here! 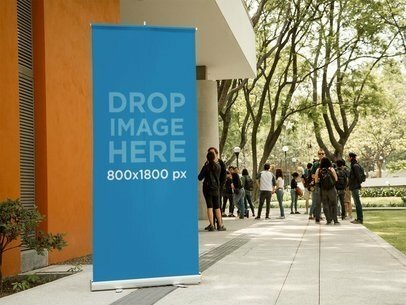 Use this real-life scenario horizontal banner mockup featuring a banner outside a modern restaurant to showcase or advertise a new product or idea and appeal to your specific target market right away! No Photoshop needed! To see another Banner Mockup click here! 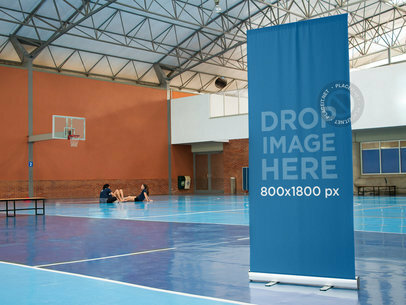 Use this original vertical banner mockup at an indoor basketball court to advertise your latest sports equipment or gear and appeal to your specific target market within no time! To customize this vertical banner mockup just simply upload an image onto the template and in just a couple of minutes get an original visual asset to help you enhance your visual marketing campaign! So what are you waiting for? It's time for you to upgrade your marketing game and believe us when we say that there's no better way for you to achieve this than with Placeit's banner mockups! To see another Banner Mockup click here! 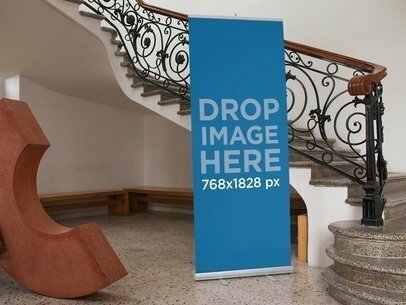 If you're looking for the right mockup to help you enhance your visual marketing campaign, then this vertical banner mockup standing next to a staircase might be just what you need. To customize this vertical banner mockup, just simply upload an image file onto the template and within no time, Placeit will resize the image for you, delivering a compelling visual asset ready to be used right away. So what are you waiting for? Stand out from the competition immediately by making banner mockups the latest addition to your marketing tools starting today! To see another Banner Mockup click here!